Self-Assessment of the Digital Status of my Office Products Business! In the fall of 2016, I put myself in the shoes of an office products and supplies reseller in recounting the "story" of a dealership successfully embracing digital technology. As regular readers will already appreciate, it takes a lot of work to get from a disjointed analog setup to a fully integrated digital capability and to set off down the path toward a business transformation. In this new blog post, I'm placing myself once again in the shoes of an office products and, in particular, aftermarket office supplies reseller. The purpose is to conduct an assessment of its current digital capabilities and to create a road map for starting a digital business transformation. To accomplish this we've developed a digital self-assessment checklist to help evaluate the business and to prepare it for setting relevant and achievable performance goals over a two-year time frame. "We're a small, local reseller in the office products industry located out of Amarillo, Texas, a city of around 200,000 folks. We've been around a long time (over twenty-five years) and have had a loyal customer base and steady business over the years. Recently, we've noticed we've been losing some customers without knowing why and our sales have started to decline. All I see on the internet is stuff about how the world is changing and how important websites and digital marketing has become. I'm starting to get worried about the future but, when I start researching into what we'd have to do, it's overwhelming and I don't know where to start. When I found this self-assessment form I decided it was a good starting point and time to start taking a serious look at where we stand and what's going to be involved to deal with the problem. The self-assessment exercise forced me to think about all the different elements of a digital strategy and opened my eyes to how ineffective our current website is, and will continue to be, unless we do something about it. I didn't know this until we completed the assessment but I can now see we only have about 100 site visits per month. I'm told these days about 60% of the buying decision has been made as a result of online research before a buyer reaches out to a salesman so, basically, our website is missing out on potential traffic [and us on new business] because it isn't providing answers to the questions in those buyer searches! For all it's current contribution, I may as well take the site down but, who can imagine a business without a website these days? That's not a realistic option, plus we spent over $15,000 developing it in the first place! What a waste of money that's been so far. Some of the requirements appear easier to fix than others. I was quite pleased with our current site grade (64/100) and, it seems, there are 10 easy points to pick up just by adding an SSL to make the site secure. With some help on the SEO and the performance side of things, I reckon we can pick up another five points fairly easily, taking us to 79/100 which I think would be pretty respectable. Unfortunately, I can see that, while it's important to fix these issues, it's not going to suddenly make our site more popular and generate a bunch of new traffic! However, the other elements of the self-assessment form helped us understand where we need to start focusing efforts to draw traffic to our website. Email marketing - We've got over 600 contacts we could be marketing to and I kind of get the concept. Unfortunately, we've been inconsistent and (on average) only sending out one blast a month. It's been a haphazard effort with no strategy or goals and we haven't tracked our open and click rates so we don't even know if they're good or bad. Bottom line, I can now see we've only been getting four or five visits a month from our email marketing. Unfortunately, I don't know if any of these visits have turned into customers because we really don't have a way to track the activity. On the social media side, again, I kind of get it, but I just don't know where to start. I've got a pretty good-sized personal network on LinkedIn but, our company page is dormant along with that of the Twitter account. I've never even setup a Google+ page. This came along after LinkedIn, Facebook and Twitter and, because those weren't really working for us, decided there was no point spending time adding yet another network we didn't know how to use. On Facebook we set up a company page and got a few followers but we don't have a social media strategy so it really doesn't do anything for us. 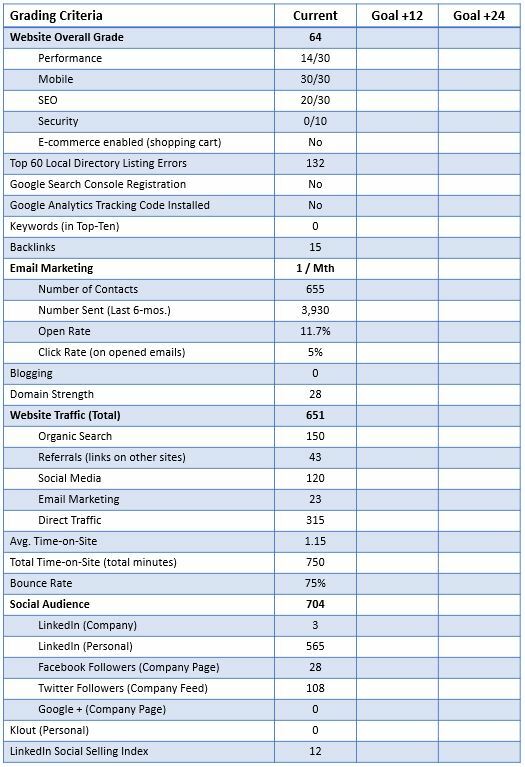 Despite all these shortcomings, I can see we get around five-times as much traffic from social media than we do from email. I know it's still small numbers but I'm starting to understand how this channel could be quite effective if only we knew what we were doing! I'd never heard of Klout or the LinkedIn Social Selling Index. I signed up out of curiosity and it was kind of embarrassing to learn how low our scores were. I'm not big into investing my time just to build bragging rights that may come with higher scores but, I can see how the indexes may be useful to help show how effective our future social media efforts may be and to keep us motivated. As for the rest of the stuff on the checklist, it's way outside my scope. Google Analytics - well it turns out I had setup an account some time in the past but I had no idea if I'd registered for the unique ID, or connected it to our site so traffic could be accurately tracked and analyzed. The Google Search Console I have never heard of and have no idea what it could do for us. I've never done any research or optimized for keywords that I'm told could bring extra traffic to the site. I just don't know where to start with any of this stuff. Time-on-site and bounce rates - that's also new to me. We have never analyzed any of this before. Blogging, I think this is probably important but, right now, I don't really understand why. Regardless, I don't have the time or the skill to start writing one. Backlinks, after working on this checklist, I did a little research and now know they're important. Trouble is, I can see they go hand-in-hand with content, such as a blog, and that's not something I can do. E-commerce has not been successful for us. We tried putting up a catalog and shopping cart site and, in over six months, we didn't get a single order. It was kind of goofy because it meant we had to run a second, standalone shopping cart site as we couldn't integrate it properly with our main site. As we now know, we don't have any traffic coming to our main site let alone trying to develop traffic to a second one! So, this initiative turned out to be another waste of money. Thing is, I think it's important to show visitors what we offer and we really need to figure out how to incorporate our e-commerce capability into the website. Consistent listings on local directories. I had no idea there were so many directories, that listings for our business may be inconsistent, or that it's important to maintain them. This is just another item on the long list of activities we need to deal with. In summary, this first part of the self-assessment exercise has been good and bad for us. The good thing is, I can now start to visualize a road map for developing a path to deal with these problems. The bad part is, I'm really concerned what it's all going to cost and how much of our time it's going to take. I'm not very tech-savvy and talk of having to deploy an integrated information technology platform makes me very nervous. I'm going to use the self assessment form to build some goals for a two-year plan and then start to develop a budget for what it would cost to implement. I kind of suspect it's going to be way more expensive than I can afford but, I can't continue to ignore the problem, so I'm just going to take one step at a time." This is the digital story of a typical smaller sized office products and supplies reseller. Mostly they're caught between a rock and a hard place. Although they have well-established local footprints and know they'll never have vast volumes of web traffic, they also know they still need an effective website and a digital strategy. However, development of these capabilities is usually neglected because of how much effort it takes to learn how to, and then, what will be required to consistently continue that effort. Ironically, most also know ignoring the problem is making it worse in the longer term as the big guys, with successful sites, get further and further ahead. We believe it's realistic for small business and sales channel development to be successful in our rapidly changing digital world but, we also know, it's necessary to put the digital platform and know-how in place before this can be achieved. In the next blog in this series, we will focus on our reseller and the efforts for establishing performance goals alongside the development of a budget for the services and other investments required to achieve the goals. Finally, we'll look at a return on investment calculation to measure if the funds required to embark on a comprehensive digital transformation make sense for smaller office products resellers to invest. We think there's a strong future for office supplies dealerships. If you're interested in how we may be able to help you with your digital transformation please click on the button below to choose a time slot that fits your calendar and ours and schedule your personal "no obligation" consultation. Why not also check out our office products story in the Twitter Moment from the link below that talks to the $20 billion growth opportunity? Despite the mature market, it's still a big market and there's a significant office products growth opportunity for those that learn how to exploit it!